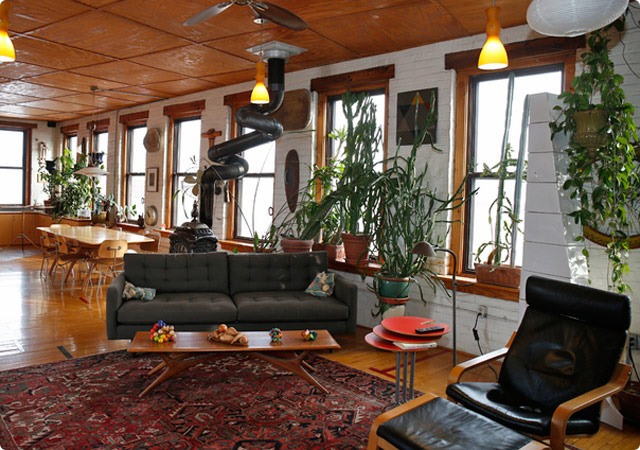 In the Camp Washington area of Cincinnati, artist Mark DeJong brings together eclectic style and design in a third floor loft that feels both wild, yet anchored. His bold design choices give the space a sense of motion, which is grounded by DeJong's choice of mid-Century modern furniture. 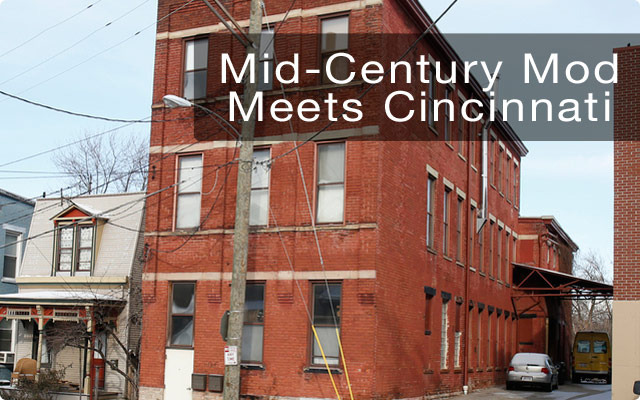 The restored loft is focused around the 18' by 45' great room; a space marrying the living, dining and kitchen together in an 810 square foot concentration of action and style. 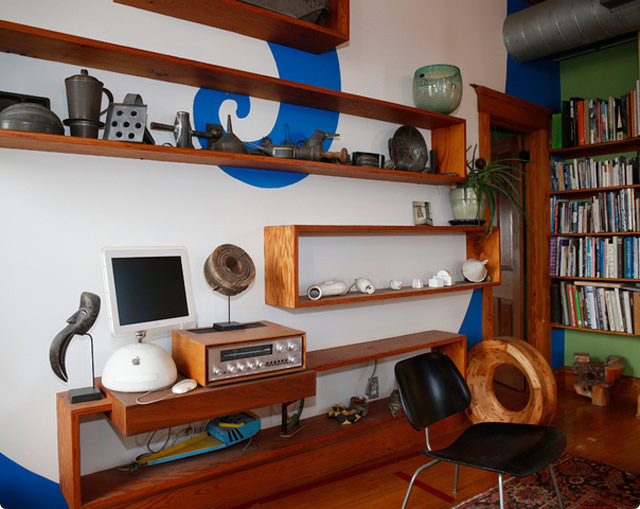 Exposed duct work, an old World patterned rug, floating shelves on a wall of white with blue waves... 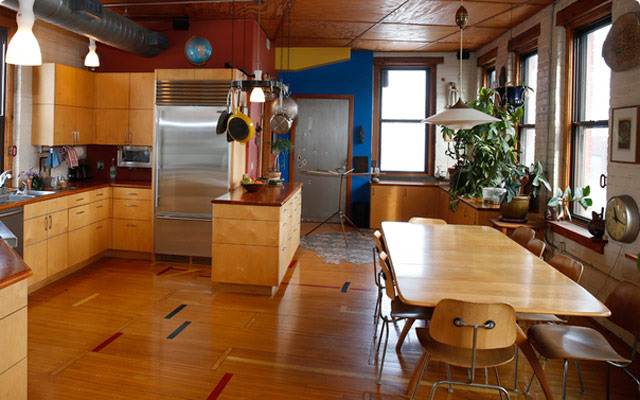 The entire living space is an expression of DeJong's bold sense of design. His focus on reclaiming the old, and re-inventing what was, naturally led to classic mid-Century modern furniture in the space. The whole space is moored by the furniture. A modern classic Eames Lounge Chair like our Helena Lounge Chair, and Ikea's Poang Lounge Chair and Ottoman create easy resting places to take it all in. The sense of motion continues with the striking freestanding fireplace case against the painted brick walls. Again, Mr. DeJong opted to go classic in the furniture selection to complete the living space. A tufted mid-Century modern sofa in gray with a coordinating wooden coffee table enables the motion of the design to feel tethered to function and comfort. Our Romano Sofa is the perfect mid-Century modern couch to achieve DeJong's look. Throw in the Palto Coffee Table in Walnut, and it's easy to center your living space around classic designs. Venting your freestanding fireplace in a loopty loop is bold. It turns out, though, the design is more than just form. The spiraling design increased the surface area of the chimney, enabling it to heat the apartment much mroe efficiently. 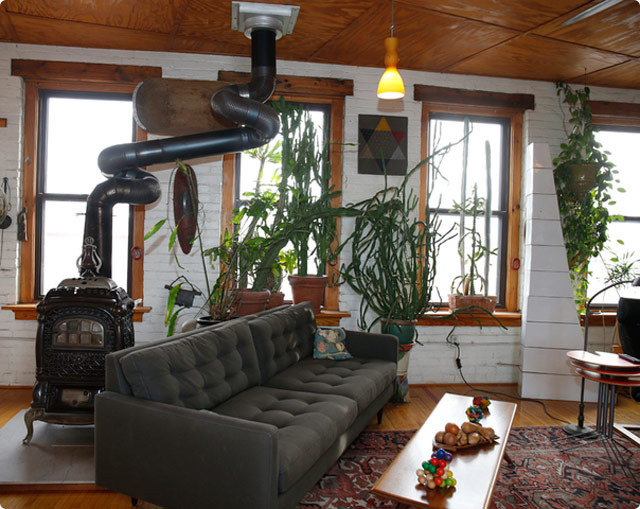 And, of course, the classic, understated sofa enables features like the chimney to make the statements. The main living space wraps up in the kitchen. Here DeJong used a blend of new and reclaimed woods cast in natural tones to keep the space feeling open and alive. 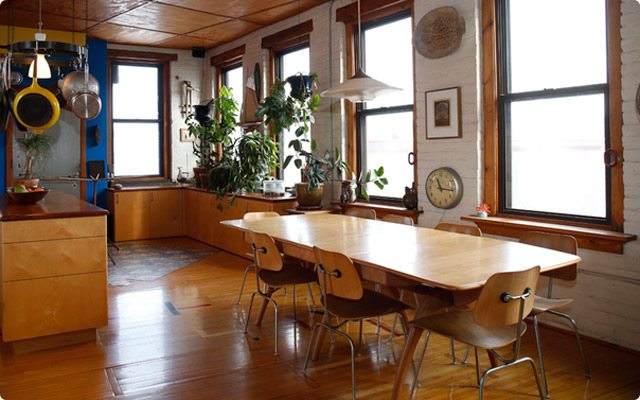 The drop leaf table is accented with classic eames chairs. You could get a similar look with our Currant Dining Table and Montreal Dining Chairs! 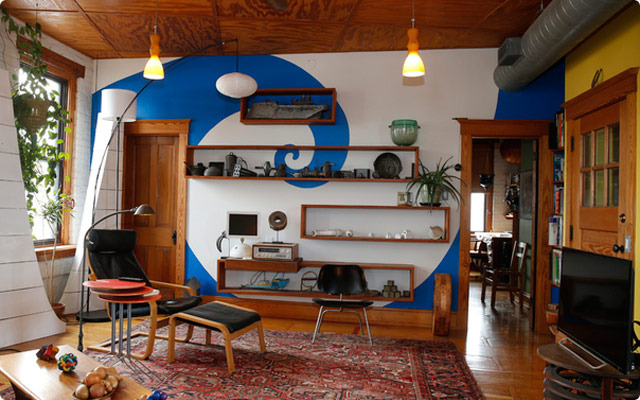 Whether you want your furniture to make the statements, or a spiraling chimney, mid-Century modern furniture designs give you the best of both worlds. Their classic, time-tested appeal can enable them to stand on their own in any room, or fall into the background of your very own bold design choices!